Socially Responsible Food Group is founded on the philosophy of healthy products for consumers made from local ingredients produced by America's farmers packaged in recyclable packaging when possible. We consider it an honor to instill habits that will properly nourish our consumers and help them develop a healthy lifestyle that will benefit them for the rest of their lives. This includes the delivery of our goods and services in a way that is healthy and fun for youth, well-received by our parents, popular with our teachers, and trusted by our customers. Premium yogurt is our passion and we consistently strive to provide our customers with fresh, premium ingredients that offer exceptional flavor. Feel confident serving Summit Premium to your customers because you know we're the real stuff, period. 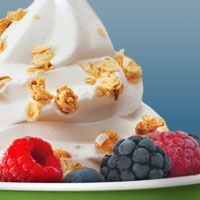 Our genuine fresh frozen yogurt is made from premium ingredients, and packed with live and active cultures. Decadently creamy, irresistibly tangy and superbly nutritious, Summit Premiums fat-free, gluten-free, and certified kosher frozen yogurt will never disappoint. SmoothEZe products were developed with School Nutrition in mind providing healthy smoothies to students. SmoothEZe are a all natural product made from real ingredients. SmoothEZe contain no additives, preservatives, artificial flavors or colors and no high fructose corn syrups. Needing no ice to blend, you always have a consistent smoothie that is simply the easiest and best tasting smoothie in this world. They not only taste great, they're healthy and good for you. With the help of Italian Gelato Masters, Summit Premium Gelato Base was designed to meet the profile of the same gelato you would enjoy on the streets of Venice, Florence or Rome. Who can't use more ideas for great flavors? Serve the Summit Premium products in your business and and we will provide custom recipes. SR Food Group recipes highlight real ingredients and seasonal favorites; tried-and-tested recipes, developed by our team with you in mind. Tested and re-tested by real gelato and yogurt businesses in kitchens like yours. So you know they'll be easy, accurate, and delicious. Contact us for recipes and get started today! Lactose intolerance affects more and more people while many others are simply choosing to reduce their dairy consumption, go dairy free or go vegan to establish a healthier lifestyle. Not only is cultured almond and cultured coconut milk dairy-free, but you also have the health benefits of added probiotics. We consider it an honor to instill habits that will properly nourish our consumers and help them develop a healthy lifestyle that will benefit them for the rest of their lives. In 2007 Tom started Socially Responsible Food Group Inc. after more than two decades on the front lines of food industry management. Socially Responsible Food Group was founded on the philosophy of healthy products for consumers made from local ingredients. Tom has developed and brought to market the SmoothEZe and Summit Premium brands with current distribution throughout the world. Today, besides developing high quality products and market introductions, he offers his years of food service experience and consults clients on all aspects of restaurant development, from idea to conception. In 2017 Tom partnered with Blue Diamond Almonds and began co-branding Summit Premium Almond Milk Yogurt made with Blue Diamond Almonds. After hundreds of grand openings and multiple product launches, Tom has perfected the art of working calmly and effectively in the most demanding conditions. Specialties: Our assignments have included every aspect of the food business from developing new formulas and recipes, to advising on production, packaging and distribution, providing co-packing and private label solutions, to setting up the right internal systems to support growth and long-term success. We offer proven results in restaurant & cafe development, restaurant remodels and remakes, menu creation, architecture & interior design, tax, financial & accounting issues, training of employees and staff. © 2007-2019 SR Food Group, Inc. SmoothEZe and Summit Premium are registered trademarks of SR Food Group, Inc. All rights reserved.